The major environmental impact of most businesses derives from energy usage. The upside of this is that using energy more responsibly improves profitability. A business’s cheapest unit of energy is also the one which is least damaging to the planet: the unit you don't use.There are many ways to make your organization's energy usage more sustainable. 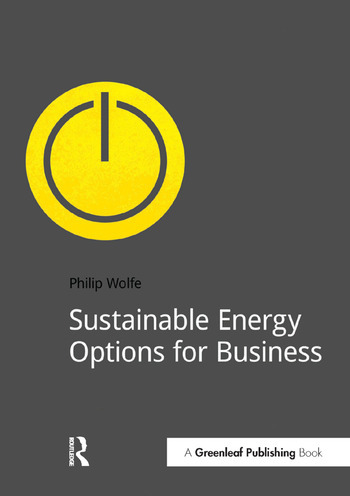 In Sustainable Energy Options for Business, Philip Wolfe outlines the best available options for (1) reducing energy use and (2) improving the sustainability of energy supply. After an introduction to regulatory drivers and management issues, Wolfe looks at energy opportunities in five key areas: 1. Saving on energy usage; 2. Finding more sustainable sources of energy; 3. Generating renewable electricity; 4. Producing renewable heat; 5. Indirect energy sustainability options.Also included: An "energy checklist" to help identify your best options and important quick wins, plus a handy reference list, signposted from annotations in the text.